Great Britain big man Eric Boateng has signed with Greek side Peristeri B.C for the coming season. The 6’11″, 260lb center spent last season in the NBA’s Development League, split between two teams, the Idaho Stampede and Austin Toros. He averaged 4.9 ppg, 4.8 rpg and 0.9 bpg in just 16 minutes per outing, with his best two outings coming in back to back performances for Idaho against Bakersfield in December where he had a 19 point-11 rebound and 16 point-13 rebound double double respectively. The Londoner also made 5 NBA appearances with Denver Nuggets in the pre-season. Peristeri compete in Greek’s top A1 league, where they went 12-14 last season finishing in the middle of the table (7th out of 14). They are 2-0 for the 2011/12 season so far. 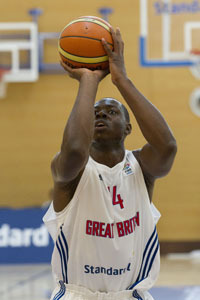 Boateng averaged 1.5 points and 2 rebounds per game this summer for GB at Eurobasket in Lithuania.